Meet First Impression Band - Indianapolis wedding band in Indiana. 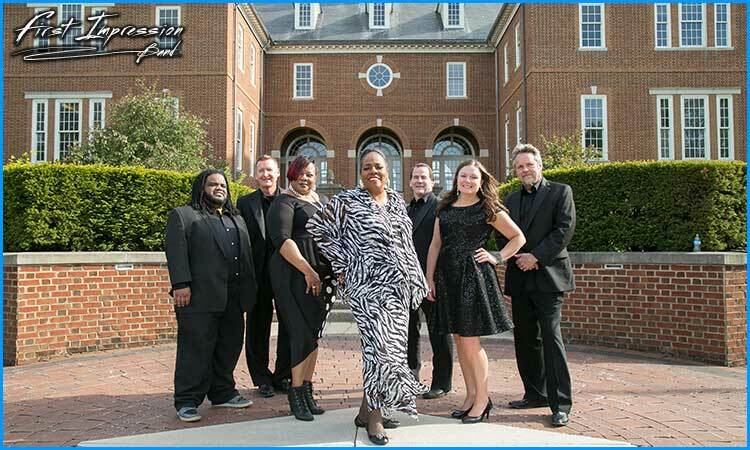 First Impression Band is a party band providing wedding musicians and dance bands in Indianapolis, IN. To hire musicians for your Indiana wedding, call First Impression Band. First Impression Band of Indianapolis specializes in playing special, memorable private events. We excel at tailoring music for wedding receptions, corporate events, country club functions in Indiana and around the Midwest. We are able to expand the band upon request, adding horns or additional vocalists, if your tastes allow. First Impression is comprised of Indiana’s finest professional musicians - experienced performers who love to entertain. And, First Impression is more than a great dance band. We are also great listeners who can assist with planning and executing your important event. So, beyond supplying great music, from cocktail piano to the “Last Dance,” we work alongside you to create the best, most memorable evening possible! Great listening and dancing music. Experience to help guide you through the event planning process. And someone to act as Master of Ceremonies at your important reception, fund-raiser, dinner-dance, or backyard soiree.